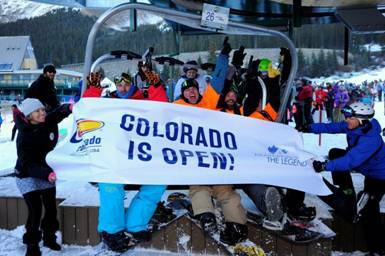 The 2013-14 ski season officially kicked off Sunday with Arapahoe Basin becoming the first ski resort in North America to open to the public, according to Colorado Ski Country USA, and now Loveland Ski Area is set to open on Thursday. A-Basin opened for the season on Sunday (A-Basin photo). Loveland opened for the season on Oct. 23 last year, with A-Basin beating them to the punch on Oct. 17. With decent natural snowfall lately (A-Basin reported 4 inches new Tuesday morning), both ski areas are ahead of that pace by several days. Loveland’s Chair 1 will crank up at 9 a.m. on Thursday and will provide access to one top-to-bottom run, comprised of sections of Catwalk, Mambo and Home Run trails. The run will be more than a mile long and nearly 1,000 vertical feet. Early season lift tickets are $49 for adults and $25 for children ages 6-14. Go to Loveland’s website for more information and to purchase season passes. After opening on Sunday, A-Basin reported one inch of new snow Monday, 4 on Tuesday, and the resort should see lingering snow showers through Wednesday. Another shot of colder air and possible precipitation is expected later this week. Next up after Loveland, Copper Mountain and Keystone are scheduled to open for the season on Friday, Nov. 1, followed by Wolf Creek and Breckenridge on Friday, Nov. 8, Winter Park on Wednesday, Nov. 13, Eldora and Vail on Friday, Nov. 22, and Crested Butte and Beaver Creek on Wednesday, Nov. 27. A-Basin COO Alan Henceroth this week addressed those who criticized the resort for kicking off the ski season on a weekend, when crowds are always bigger. “It was a little bit busy, but spirits were high,” Henceroth wrote on his blog. “There has been a lot of discussion and questions about opening weekday or weekend. Ideally, we like to open on a weekday, giving us a chance to ‘ease’ into the season. Now snow riders have all week to take laps at A-Basin, and Loveland joins the fray Thursday. The weather will continue to cooperate this week but then give way to warmer, drier conditions next week, according to Opensnow.com.